A Psychedelic Fairytale Like No Other! As we've said the story is absolutely bonkers, calling it strange or weird is a huge understatement, however it still had us interested in what was going to happen next and was overall, extremely enjoyable albeit in the same way we'd imagine a psychedelic hallucination would be like. Regardless it's fun so just enjoy the craziness! The gameplay is top-notch and we dare say it's the closest thing to a perfect dungeon crawling JRPG that we've ever played. The gameplay progression flows in typical dungeon crawling fashion with a few twists here and there. Basically you must search the dungeons to find a certain something to destroy to weaken the normally immortal nightmares, which are the bosses of the various dungeons, head back to the Liberated Zone "safe area/town" and prepare for the next dungeon. 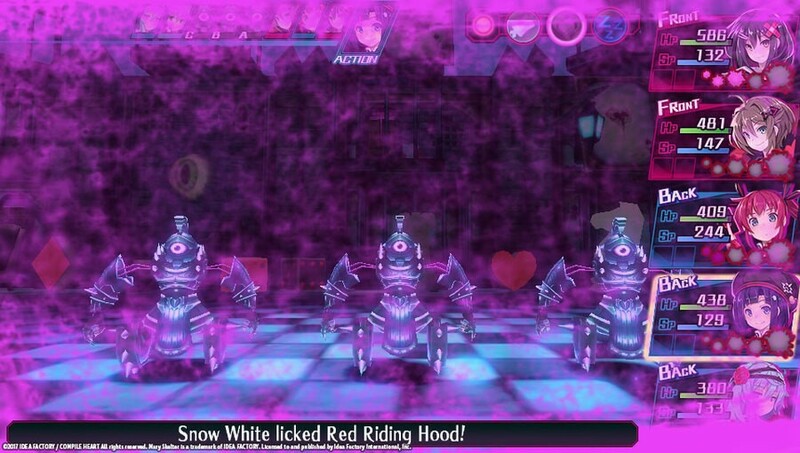 There are also plenty of classes and skill trees that you'd expect from a game in the dungeon crawling sub-genre of JRPG's, but what IS unique about Mary Skelter: Nightmares is the Blood System. The horoins of the game can power up during battle by accumulating blood spatter from fallen enemies. Once enough splattered blood accumulates the maiden will enter Massacre Mode which not only strengthens her, but also gives her access to ultra powerful skills that she can't use in her normal state. 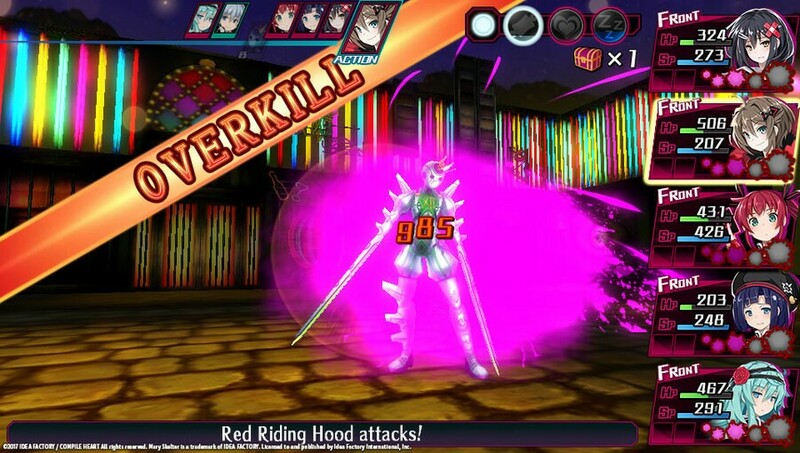 Massacre Mode is a double-edged sword however as the more damage a maiden takes during battle the more corruption she will build up and if corruption is left unchecked the maiden will enter her psychotic "Skelter Mode". In this state she'll murder friends and foes alike. To prevent this you must use the hero's Mary Gun to splatter his unique blood on the maidens to cure their corruption. Other gameplay elements include guild quests and even decorating the various maiden's rooms as well as bonding with them. The controls in the game are quite intuitive and easy to learn especially on the PSTV which is always a good thing in our opinions! 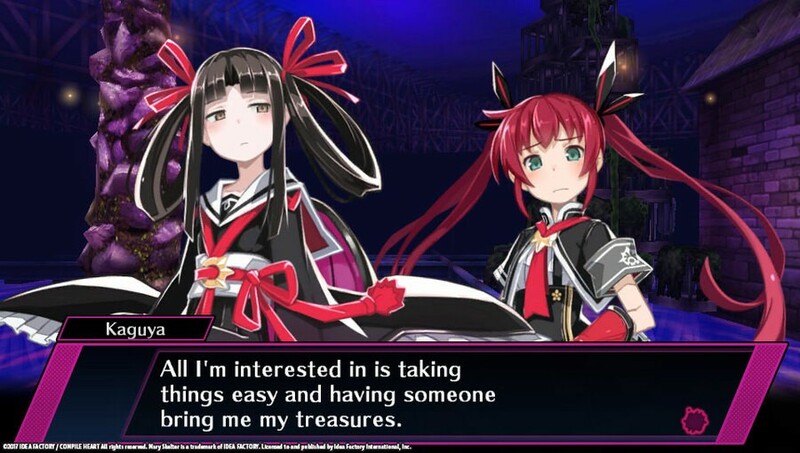 In-terms of difficulty Mary Skelter: Nightmares starts off relatively easy, but becomes tough as nails really early on so expect a fierce amount of challenge from this incredibly thrilling game! Visually the game looks incredible with gorgeous character models, and creepy as heck dungeon designs that might give some of you nightmares. The special effects are also nice to look at as well. As for the soundtrack it's fantastic and fits the game perfectly. 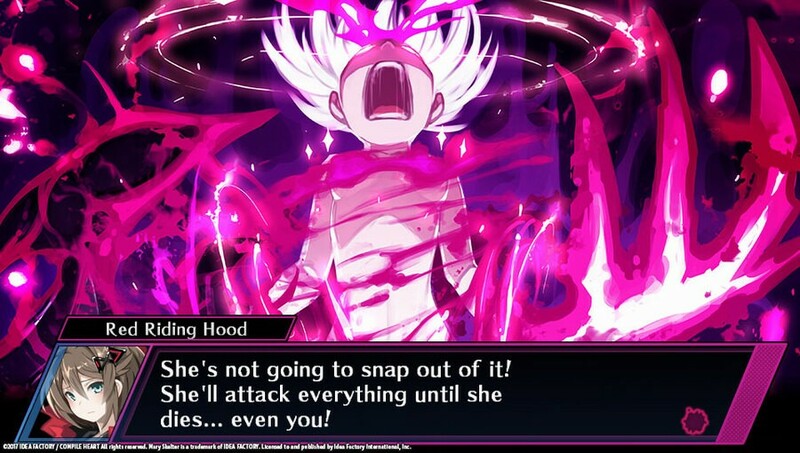 With excellent gameplay and flawless controls, Mary Skelter: Nightmares will have you hooked immediately and the bizarre yet highly enjoyable story and top-notch audio-visual presentation will keep you coming back for more! 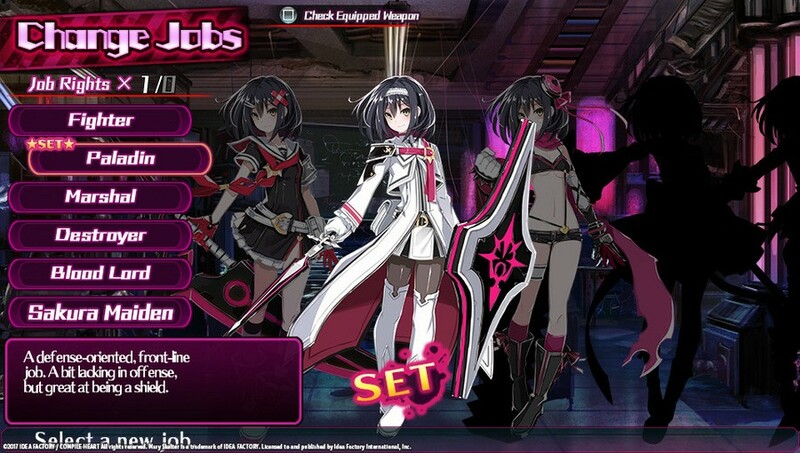 Mary Skelter: Nightmares is one of the absolute best dungeon crawlers we've ever experienced and as such we highly recommend the game to any and all fans of the genre! A twisted game? Demonic Yoshi approves! @Reanfan Masterful review, my friend! The header image in the article is really twisted. I'm actually surprised you used that image tbh. Hopefully the SJW's don't come out of the woodwork. Anywho good review Brian! Nice review! This has to be the strangest sounding game I've ever heard about lol. I'm sorry I didn't see this sooner because I woulda commented! Nice review! I like dark games so I might give this game a go. @StarOceanCrazy No worries! @Kain Thanks for the comments you guys!